Have you ever wondered the difference between Memory Foam and Latex Foam Mattresses? Have you then wondered which one is best and which one gives the best night sleep? The answer to the first question is easier to answer and is the purpose of this article. The answer to the second question will not be directly answered here, as more research by the individual consumer and science would be required. As we explore each one, we will compare by explaining how each is made and some of the specifics of each. It will be left to the reader to take this information as a building block in their search for that perfect night’s sleep. Basically it is a petroleum based product using polyurethane foam. Polyols, Isocyanates, and various different reacting agents are all mixed together and whipped into froth. This is poured into a mold and an exothermic reaction chemically occurs. The next step is to create an open-cell matrix. This is accomplished by either infusing gas, or a similar blowing agent or using a vacuum seal process. It is then cooled and later re-heated to “cure”ii The end result is a material that is no longer reactive, and has the indention properties desired. This indention property is what conforms to your body while sleeping. Different processes create differed indention properties. These are known as Indention Force Reflection (IFR) or Indention Load Deflection (ILD). The standard is the force required to make a 25% indention in a four inch square thick foam. This measurement is coupled with foam density measurements up to 7 lbs. So now you have the density to ILD comparison and you can create a combination to suit just about anyone’s body weight and comfort. This range of comparisons is extremely varied and is where finding that best combination makes it difficult to find the exact right mattress for an individual or a couple. The composition of Latex in general is rubber. It is a milky white substance taken from rubber trees (Ficus elastica). The most common tree used now is Pará rubber tree (Hevea brasiliensis).iii The amount of substance from the rubber trees needed for one queen size mattress is about 12 acres full of rubber trees and the amount of substance extracted in a day. There are basically two methods used to create the latex mattress. They are the Dunlop and the Talalay Methods.iv We will explain them both here. However, both methods initially use a small amount of additives, or mixtures that will later help the material to solidify. The Dunlop Method requires the mixture of additives to create a foamy substance. It is then placed into the shape molds, heated in an oven causing it to solidify. Once this is completed, it goes through a washing cycle removing any unwanted residual or non-solids. It is cut into blocks for intended use and air dried. It is then ready for distribution. 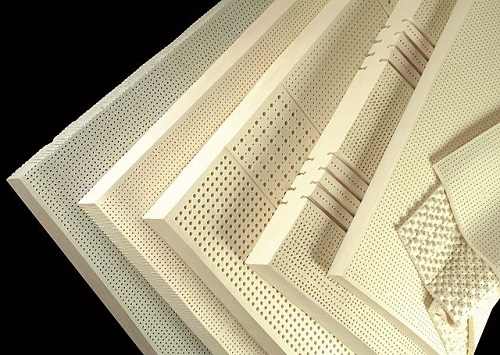 A later manufacturing process came along called the Talalay Method. First, as above the liquid formation is created. It is then poured into molds, the shape desired. It is sealed and a vacuum is created by extracting the air allowing even distribution of the foam inside the mold. It is then flash frozen and flash heated until solidified. Once cooled it can then be cut into blocks! These blocks cannot be too large, so for any large need like a mattress is cut into smaller blocks and glued together. This process creates a different texture than the Dunlop Method. The latex mattress is purported to be much more environmentally friendly during the manufacturing process than the Memory Foam Mattress. It is also considered by many experts to have fewer toxins in the finished product than the Memory Foam Mattress. However, the jury is still out on that. When doing your research on this, always look at who is sponsoring the research. Does the report have a vested interest in promoting one over the other? Is it a grant project looking for a desired outcome? Maybe they are comparing between these two, and not even considering air mattresses or old fashioned spring type mattress. These are all questions you must ask yourself in order to arrive at the most unbiased research available. Each type has its own set of pros and cons. Each type has its own place in our world. As with any product, the best objective research is the individual who decides based on personal likes, quality of sleep and subjective results. In some cases, it may be that neither product works for you as well as the old fashioned spring mattress or even a spring mattress. You decide! Betty Norris. "Difference between Memory Foam and Latex Foam Mattresses." DifferenceBetween.net. August 15, 2016 < http://www.differencebetween.net/miscellaneous/difference-between-memory-foam-and-latex-foam-mattresses/ >.